Visitors to historic Southport who want to make a beach escape, or Carolina Beach travelers who need an easy yet scenic route to head south will find the Southport / Fort Fisher ferry a convenient yet completely unique way to explore the southern North Carolina coastline. Though just a short 35 minute ride from the mainland to Pleasure Island, (the home of Fort Fisher State Park, Carolina Beach and Kure Beach), this ferry trip nonetheless gives its passengers exceptional views of the Cape Fear River, and an incredible story to take back home. The Southport / Fort Fisher ferry is one of seven North Carolina Department of Transportation (NCDOT) ferries that service the slightly-inland communities and barrier islands of the state. Southport and Fort Fisher are actually the southernmost terminals of the ferry routes, and provide a valuable service to both Carolina Beach residents and visitors alike. Connecting Pleasure Island with the mainland, the ferry can save Fort Fisher or Southport visitors plenty of driving time by circumventing the vehicular route that goes up the coast, crosses over the Wrightsville Beach Bridge (or US 74) in the town of Wilmington, and then heads back south to the respective Southport or southern barrier island destination. Instead, the ferry provides virtually a straight shot across the wide Cape Fear River, connecting the two remote communities, and giving southern North Carolina fans an easy way to access the stunning coastlines of Fort Fisher, Kure Beach and even Carolina Beach. The ferry can be accessed in Southport via route 211, and by Fort Fisher by basically following 421 south until it ends. Both terminals have public restrooms, concessions, and plenty of local area information for newcomers to the area. Reservations are not required, however a small fee applies to both passengers and vehicles wishing to board. Fares are inexpensive and range from ~$1 - $15. See more about fares here. The ferry schedule varies depending on the time of year, but generally runs year-round from 5:30 a.m. until 7:00 p.m., depending on the departure ferry terminal. From late September until the end of March, the ferry has approximately 14 crossings throughout the day, leaving each terminal every 45 minutes or so, and in the summer season from April until shortly after Labor Day, the runs increase slightly to around 16 crossings per day. Reservations are not required, however travelers are advised to watch out for popular "prime times" when lines can be long, and a wait is to be expected. Summertime weekends are especially popular, as are long weekend holidays and mid-morning arrivals to Fort Fisher or late afternoon departures headed back to Southport. Visitors who want to stay ahead of the traffic are advised to aim for a weekday, when ferry traffic is significantly less, or try to be an "early bird" and catch the 8:30 a.m., 7:45a.m., or even 7:00 a.m. departure when ferry traffic is minimal. The trip to and from Fort Fisher is a fun aspect of a Carolina Beach vacation in its own right, featuring incredible far-away views of the banks of the Cape Fear River, dozens if not hundreds of seagulls that follow the stern of the boat begging for handouts, and miles of open water in virtually every direction. Cameras are a must for this adventure, and the ferries provide ample space along the outdoors decks to enjoy the views, as well an expansive climate controlled passenger lounge on the top level of the ship to enjoy a bird's eye vista in comfort. Restrooms and water fountains are available as well, and visitors are free to get out of their vehicles and explore the ferry at their leisure. Even pets are allowed provided they are leashed, however, visitors should note there is no smoking or alcohol allowed anywhere on board. Ferry passengers will also enjoy a fantastic treat around sunset, when the Cape Fear River lights up in hues of orange, pink and purple, and passing schools of fish and flocks of migrating birds add to the inspiring natural scene. Essentially, the river views are unparalleled in this part of southern NC, and the short 35 minute trip will illuminate this region of the coastline and present an entirely new perspective of the Cape Fear River for infrequent visitors and longtime residents alike. A less congested way to tour the coastline, and an often welcome break out of the car for long distance travelers, the Southport / Fort Fisher Ferry is easily the most scenic way to reach the beach. Relaxing, accommodating, and altogether a fantastic way to explore the wide open expanse of the Cape Fear River, a quick trip on the Southport / Fort Fisher Ferry is sure to become a favorite memory of any Carolina Beach, Kure Beach or Fort Fisher vacation. Arrive early with the sunrise, or catch an evening sunset, and make your trip to or from Pleasure Island an undisputed part of the fun and overall coastal experience. What is the Southport - Fort Fisher Ferry? The Southport - Fort Fisher Ferry is a vehicular and fee-based ferry that connects the town of Southport with the barrier island town of Fort Fisher on the southern end of Pleasure Island. Who runs the Southport - Fort Fisher Ferry? The Southport - Fort Fisher Ferry is managed by the North Carolina Department of Transportation (NCDOT) Ferry System, and is one of seven ferries that the NCDOT manages in the state. Where is the Southport - Fort Fisher Ferry? The Fort Fisher terminal of the Southport - Fort Fisher Ferry is located on the southern end of Fort Fisher, just past the North Carolina Aquarium. The Southport terminal is located on the appropriately named Ferry Road, which is slightly north of the historic downtown Southport area. How much is the Southport - Fort Fisher Ferry? The fare to cross the Southport - Fort Fisher Ferry is dependent on vehicle type. Vehicles less than 20’ feet are generally around $5, while pedestrians and cyclists are $1-2 dollars per crossing. How long is the Southport - Fort Fisher Ferry ride? The total crossing time for the Southport - Fort Fisher Ferry is approximately 35 minutes each way. Are there motels near the Southport - Fort Fisher Ferry? There are motels and hotels close to the Southport ferry terminal in both the downtown region and the greater Southport region. Near the Fort Fisher Terminal, there are a number of hotels, motels, and vacation rentals in the towns of Kure Beach and Carolina Beach. What are the attractions near the Southport - Fort Fisher Ferry? The Fort Fisher terminal of the Southport - Fort Fisher Ferry is next to the North Carolina Aquarium at Fort Fisher, as well as the Fort Fisher State Park and Historic Site, and Zeke’s Island Reserve. The Southport terminal is nicely close to the downtown area, which is known for its historic landmarks, restaurants, antique stores and shopping, and its small-town, coastal atmosphere. Can you take pets on the Southport - Fort Fisher Ferry? Pets are permitted on the Southport - Fort Fisher Ferry, and are free to explore the deck, but must be on a leash if they leave the vehicle. Owners should note that the decks can get hot for dogs’ paws in the summertime, and should use caution as needed. Can you walk onboard the Southport - Fort Fisher Ferry? Pedestrians are welcome on the Southport - Fort Fisher Ferry for a small fee in the $1 dollar range. Can you ride a bike on the Southport - Fort Fisher Ferry? Cyclists are allowed on the Southport - Fort Fisher Ferry for a small fee of about $2. Please note that there are no bike racks on board the Southport - Fort Fisher Ferry. Can you take a vehicle on the Southport - Fort Fisher Ferry? The Southport - Fort Fisher Ferries are designed as vehicular ferries, so licensed vehicles of all sizes that are legal on the highway are permitted to board. Please note that the crossing fee may be a little more for vehicles over 20 feet. Should you make a reservation for the Southport - Fort Fisher Ferry? The Southport - Fort Fisher Ferry does not accept reservations. What are the busiest days for the Southport - Fort Fisher Ferry? The busiest days for the Southport - Fort Fisher Ferry tend to change by the season, but generally, weekends can have a steady line of traffic due to day-trippers as well as people arriving for their vacation, especially in the summer months. When is the best time of day to go on the Southport - Fort Fisher Ferry? Are there restrooms on the Southport - Fort Fisher Ferry? There are public restrooms on board the Southport - Fort Fisher Ferry, which are located on the main deck. Can you smoke on the Southport - Fort Fisher Ferry? There is no smoking permitted anywhere onboard the Southport - Fort Fisher Ferry, which includes the passenger lounge, exterior decks, and in the inside of a vehicle. Can you drink alcoholic beverages on the Southport - Fort Fisher Ferry? Open alcoholic beverages are not allowed on board the Southport - Fort Fisher Ferry, which includes decks, lounges, and inside individual vehicles. Can you fish off the Southport - Fort Fisher Ferry? Fishing is not allowed off the decks of the Southport - Fort Fisher Ferry. How many vehicles can the Southport - Fort Fisher Ferry carry? 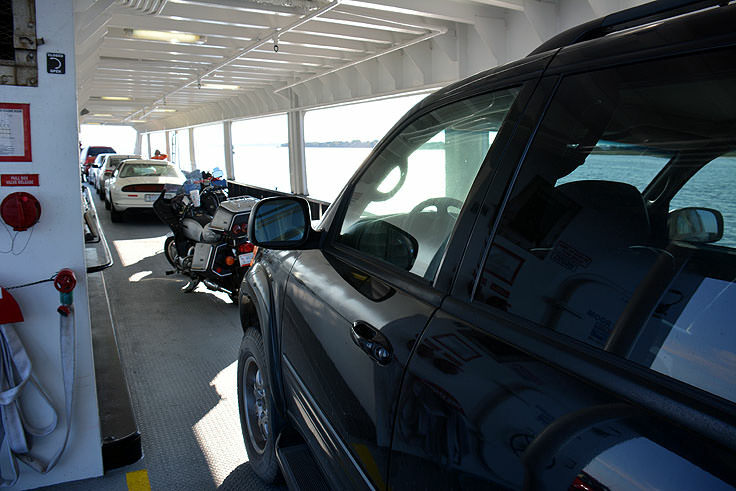 The number of vehicles that can fit on the Southport - Fort Fisher Ferry depends on vehicle type and the individual ferry, but roughly 30-40 vehicles can fit on each vessel. Are there vending machines or food available on the Southport - Fort Fisher Ferry? There are no vending machines or drinks available onboard the Southport - Fort Fisher Ferry, however there is a water fountain for passengers. In addition, vending machines with snacks and drinks are available at the Southport - Fort Fisher ferry terminals. Is the Southport - Fort Fisher Ferry air conditioned? The Southport - Fort Fisher Ferry has a passenger lounge on the second level of the vessel, which is climate controlled and therefore air conditioned in the summer months, and headed in the winter months. Is there a passenger lounge on the Southport - Fort Fisher Ferry? 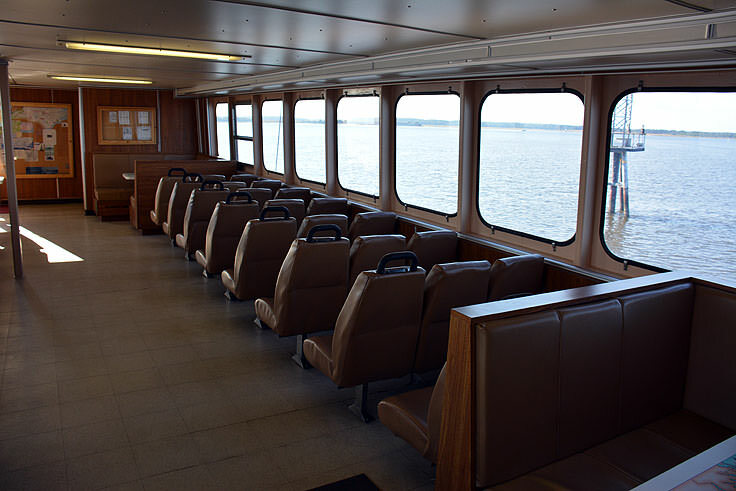 The Southport - Fort Fisher route ferries do have climate controlled passenger lounges on the second level of the vessels. Is there internet access on the Southport - Fort Fisher Ferry? Some of the ferries that service the seven North Carolina ferry routes may have limited wireless internet access available. Can you get out of your vehicles on the Southport - Fort Fisher Ferry? Visitors are free to get out of their vehicle and explore the first and second level decks, as well as the passenger lounge, while on board the Southport - Fort Fisher Ferry. Visitors should not exit the vehicle until the ferry has left the docks, and has started the crossing. Can you feed seagulls off the Southport - Fort Fisher Ferry? Visitors should not feed seagulls off the back of the Southport - Fort Fisher Ferry. How soon before departure does the Southport - Fort Fisher Ferry board? The Southport - Fort Fisher Ferry generally starts boarding about 10 minutes before the scheduled departure time. All visitors should be in their vehicles and ready to board roughly 15 minutes before their ferry is slated to depart. What happens if you miss the Southport - Fort Fisher Ferry? The Southport - Fort Fisher Ferry runs throughout the day, so vehicles can wait until the next ferry becomes available in roughly 45 minutes, depending on the season and time of day. In addition, visitors can drive around through Carolina Beach and Wilmington to reach Southport or Fort Fisher. How late does the Southport - Fort Fisher Ferry run? The last crossing for the Southport - Fort Fisher Ferry from the Southport terminal is 6:15 p.m. The last crossing from the Fort Fisher terminal is 7 p.m.
How early does the Southport - Fort Fisher Ferry start running? From Monday through Friday, the first crossing from the Southport terminal is at 5:30 a.m., while the first crossing from the Fort Fisher terminal is at 6:15 a.m. On the weekends, the first crossing from the Southport terminal is at 7 a.m., while the first crossing from the Fort Fisher terminal is at 7:45 a.m.
How often does the Southport - Fort Fisher Ferry run? From mid-morning until late afternoon, the Southport - Fort Fisher Ferry generally runs every 45 minutes from both terminals. In the early morning hours and evenings, the ferry runs roughly every 90 minutes. Does the Southport - Fort Fisher Ferry run in storms or hurricanes? The Southport - Fort Fisher Ferry does not operate in hurricanes, storms, and weather events with high sustained wind speeds and gusts, as a safety precaution. Where are the docks for the Southport - Fort Fisher Ferry? The docks for the Southport terminal are located along Ferry Road, just north of the downtown area, and on the edge of the Cape Fear River. 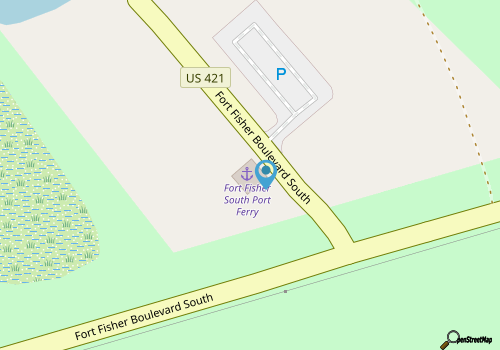 The docks for the Fort Fisher terminal are located almost at the end of US 421, next to Federal Point. How far is the Southport - Fort Fisher Ferry from the Fort Fisher Aquarium? The Fort Fisher terminal of the Southport - Fort Fisher Ferry route is roughly .75 miles away from the North Carolina Aquarium at Fort Fisher. How far is the Southport - Fort Fisher Ferry from downtown Southport? The Southport terminal of the Southport - Fort Fisher Ferry route is approximately two miles away from the heart of downtown Southport. How far is the Southport - Fort Fisher Ferry from the Fort Fisher State Park beaches? The Southport - Fort Fisher Ferry is less than a mile away from the Fort Fisher State Park beaches. Does the Southport - Fort Fisher Ferry operate year-round? The Southport - Fort Fisher Ferry does operate year-round, however, it has slightly fewer crossings per day in the off-season months, or generally from early September until the end of March. Can you drive to Fort Fisher? Visitors can drive from Southport to Fort Fisher instead of taking the Southport - Fort Fisher Ferry. The Southport - Fort Fisher Ferry crossing is about 35 minutes, while the drive is a little more than an hour, depending on traffic.